Crystals containing the quantum data after the teleportation has taken place. We're one step closer to creating the Ansible communicator in "Ender's Game," the warp drive envisioned by Mexican physicist Miguel Alcubierre and a "Star Trek"-style Transporter. Or we can at least keep thinking that while scientists do the hard, incremental physics required to keep us dreaming of those kinds of future advancements. This time the progress comes from a research team out of the lab of Professor Nicolas Gisin in the physics department at the University of Geneva. 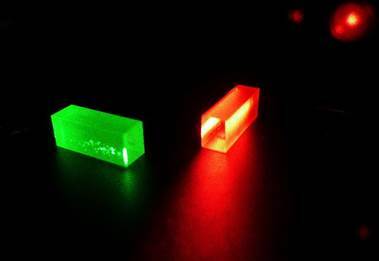 The team achieved teleportation of the quantum state of a photon -- in this case, it's known as the photon's polarization -- to a crystal-encased photon more than 25 kilometers (15.5 miles) away. The distance breaks the previous record of 6 kilometers (3.7 miles) set 10 years ago by the same team using the method. This marks the latest success in a series of experiments the group, led by physicist Félix Bussieres, has been conducting over the last decade in an effort to better understand quantum data transfer with ever-newer technology. The results, which were achieved in March, were published in the journal Nature Photonics on September 21. In this particular experiment, the researchers stored one photon in a crystal, essentially creating a solid-state memory bank. They sent another photon of a different wavelength 25 kilometers away through optical fiber, whereupon they had it interact with a third photon. Because the first two photons were entangled -- a quantum property meaning the particles could speak to another across an infinite distance -- the interaction sent the data to the photo stored in the memory bank, where the team was able to retrieve it. "It is a bit like a game of billiards, with a third photon hitting the first which obliterates both of them. Scientists measure this collision. But the information contained in the third photon is not destroyed -- on the contrary it finds its way to the crystal which also contains the second entangled photon." Quantum teleportation, though not the kind of "beam me up" transportation we imagine, is the moving of quantum data -- meaning classical bits are off the table for now -- from one location to another without having to travel the distance between them. That means speeds and the receiving of data aren't necessarily held down by the constraints of space and time. In that sense, it's easier to think of this kind of teleporting not as we do in science fiction, but as an exchange of information that you know, ahead of the transfer, is either A or B. For example, if you and a friend have two playing cards -- the ace of spades and the ace of hearts -- and you each blindly pick one, walk into different rooms and then look at the card in your hand, you'll both know instantly know what card your friend has. It's that kind of instantaneous awareness between two points -- instead of cards, think spin states of an electron -- that physicists call teleportation because the data point doesn't require you to observe it directly or have someone send it back for confirmation. While it may not seem terribly exciting on the surface to teleport the other half of a simplified picture, it opens up startling possibilities. Imagine a future with more instantaneous communication with astronauts in space or rovers on Mars alongside unprecedented network speed and security thanks to quantum encryption. For non-quantum physicists, the novel aspect of this experiment is that the team achieved teleportation of data across the kind of optic fiber that forms the basis of modern-day telecommunications. 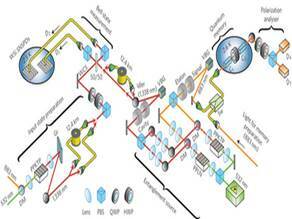 One day, researchers hope, we'll have a quantum Internet with "quantum routers that can receive quantum information from location and route it on to another without destroying it," writes the MIT Technology Review. Gisin's lab is bringing that closer to reality by laying the scientific foundation for that kind of monumental network advancement. As physicists continue to push the boundaries of the our understanding about the quantum world, we're getting closer to translating these kinds of advancements outside the lab. More practical applications like quantum computing and quantum encryption are burgeoning markets that in the last few years have exited research labs and entered commercial arenas like banking security, medical research and other areas in need of huge computing muscle and super-fast information transfer. With the rise of a potential quantum Internet on the horizon, we could see the next jump in communication happen over the next couple of decades. So while we're a long way off from trying to pry quantum teleportation and entanglement from the grip of the theoretical realm, scientists are making headway, if only a handful of kilometers at a time. Update at 9:40 a.m. PT, Wednesday, Sept. 24: Clarified that quantum teleportation does not yield faster-than-light communication -- nor does it allow the transfer of classical bits, only quantum qubits or states -- because it depends on the constraints of classical communication.